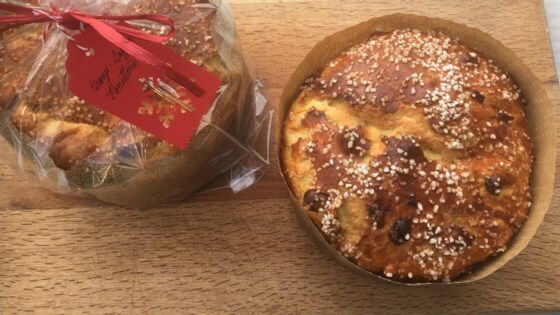 "This golden Christmas bread is worthy of its costly ingredients. It's studded with candied orange and lemon peel and Cointreau-soaked golden raisins, topped with pearl sugar. Make the sponge and soak the raisins the night before mixing the dough; the final dough needs time to ferment, as well. It's rich and buttery like a brioche and needs time to firm up in the refrigerator. This makes a lovely weekend project!" Prepare the sponge the night before you mix the dough: Mix 1.5 cups all-purpose flour with 1/8 teaspoon yeast in a bowl. Add 2/3 cup cool water. Cover with plastic wrap and let sponge stand at room temperature 8 hours to overnight. Toss raisins with Cointreau in a bowl. Mix orange and lemon peel in with raisins and add an extra tablespoon of Cointreau and let them soften, if they are on the hard side. Cover with plastic wrap and let stand 8 hours to overnight. Pour milk into a saucepan and crumble in saffron threads; heat just to a simmer. Transfer to the bowl of a stand mixer, taking care to get all of the saffron bits into the bowl. Let cool to just barely warm (110 degrees F) or room temperature. Transfer sponge to a mixing bowl, breaking up slightly with a spoon. Mix in eggs, stirring a few times by hand. Add 2 1/3 cups bread flour, sugar, 2 1/4 teaspoons yeast, and salt. Mix with the paddle attachment on low speed for about 5 minutes, stopping to scrape down sides of bowl occasionally; the dough will be very loose. Switch to the dough hook attachment and increase speed to medium. Add butter, one piece at a time, mixing until each piece is fully incorporated. Increase to high speed for 1 minute if the mixer can handle it; the dough should be climbing the dough hook and starting to clear the sides of the bowl. Add soaked raisins, orange peel, and lemon peel. Mix on low speed for 2 minutes; the fruit may not be fully dispersed. Transfer dough to a greased bowl. Flop the dough over itself a couple of times (it's a little too wet to fold), cover the bowl with plastic wrap, and let rise for 60 minutes. Fold dough a few times to release gas and mix in fruit. Cover again with plastic wrap and refrigerate for 4 hours or overnight. Turn the dough onto a floured work space. Divide in half and shape into 2 balls. Place each ball seam-side down in a 6" paper panettone form and set on a baking sheet. Beat egg with water, and brush egg wash onto each loaf. Cover panettone forms loosely with plastic wrap and let rise until doubled, about 90 minutes. Brush loaves with egg wash again and sprinkle pearl sugar on top. Place baking sheet in the hot oven, immediately reducing the temperature to 375 degrees F (190 degrees C). Bake for 20 minutes, then rotate the baking sheet and bake for an additional 10 minutes. Reduce oven temperature to 350 degrees F (175 degrees C) and continue baking until a tester inserted in the center of each loaf comes out clean, about 20 minutes more. Cool completely on a wire rack before slicing. I use SAF Gold instant yeast because it's been specially formulated for use in sweet rich doughs like this. It's sold in 1-pound packages and is available in specialty markets and online. If you rarely bake, use instant yeast packets or bread machine yeast. If you want to really make this from scratch, you can candy your own citrus peels. I buy organic oranges and lemons, blanching the orange peels 3 times and the lemon peels 4 or 5 times before adding them to the sugar syrup. Store candied peels in their syrups in the fridge for up to 6 weeks. Freshly candied citrus peels are nice and soft, so I don't soak them the night before; just add them to the dough in Step 4.